The village blacksmith was once woven so tightly into the fabric of society that nearly every civic happening was dependent upon their work. Nails to build a house, horsepower being dependent upon horseshoes, in the absence of the blacksmith, metal was static, its uses and potential minimized. Blacksmiths have long prided themselves on the fact that all other trades have essentially flowed from them. Blacksmithing: the tools to make the tools. Hammers, axes, picks, blades, if it did work, it was likely born from a smith’s shop. Enter the industrial revolution, global savior and spoiler alike. With it came the advent of mass produced iron-workings; the days of sifting through rubble in search of handcrafted nails were over, the absolute vitality of the village smith no more. Today, artisans continuing to practice this age-old craft are being forced to seek out new and specialized markets. Yet far from becoming marginalized and obsolete, these untapped niches are not only keeping blacksmithing alive, it is allowing it to prosper, particularly here in the Elk Valley. 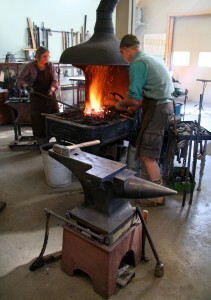 David and Sandra Barrett’s Fernie Forge has been lit since 2005, just a short time after their seamless relocation from England in 2004. David is a fifth generation blacksmith, having taken over his father’s business in 1993, the same British forge founded by his great grandfather in 1893. It was also in 1993 that Sandra began pursuing the vocation, like David, becoming accredited at the British National School of Blacksmithing. Yet in Europe, the role of the traditional smith was diminishing, especially within the agricultural sector. Once mutually dependent upon one another, the market became chaotic; with plummeting grain prices and an outbreak of mad cow disease, the Barretts knew sustaining the family business would require adopting a new paradigm. Combining David’s engineering background with Sandra’s longtime experience as an architectural librarian, the move to the domestic and ornamental side of blacksmithing seemed a natural fit. 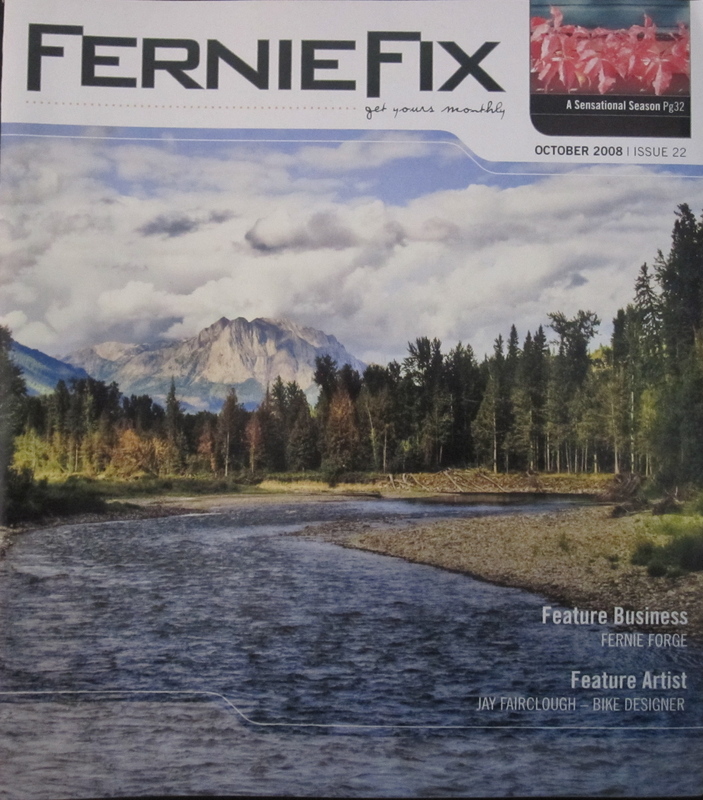 The Fernie Forge sits on more than 10 acres of farmland just a short drive east of Fernie along Highway3. Uprooting the forge from its British roots and transplanting it to the Elk Valley was a highly calculated decision, as market research revealed immense potential given the recent trends in development. While originally the move to Canada was intended to slow the pace of business, a local construction company seeking to fulfill a tall order of handcrafted railings immediately approached the Barretts. Inside they work opposite sides of the forge, employing both traditional and contemporary methods to heat and shape the metal. While they work primarily in steel, they are setup to incorporate all types of metal in their work. With upwards of 80 percent of all shop hours devoted to the production of railings and gates, many orders call on the use of contemporary methods where modern fabricating techniques produce straight lines and perfect angles. As is the case in many historic cities, says David, heritage houses proudly display iron railings, fixtures and other metal ornamentations dating back hundreds of years. These handcrafted artifacts are, of course, the work of traditional blacksmiths. In Fernie, however, “there just isn’t a history here of our type of work,” he says. But that’s all changing. Many of their pieces are quietly becoming permanent mainstays, visible in municipal parks, businesses, as well as private and commercial properties. With their Highway 3 homestead a virtual gateway to Fernie and the rest of B.C., opening up their workshop to the public is now simply a matter of time. Though, admittedly, there isn’t much of that these days. Having recently contracted to fill their largest order to date, the start of weekly open-house demonstrations and a public gallery will likely be a project for 2009.